Posted by DustinRJay in stock market, stocks, Uncategorized, volatility. 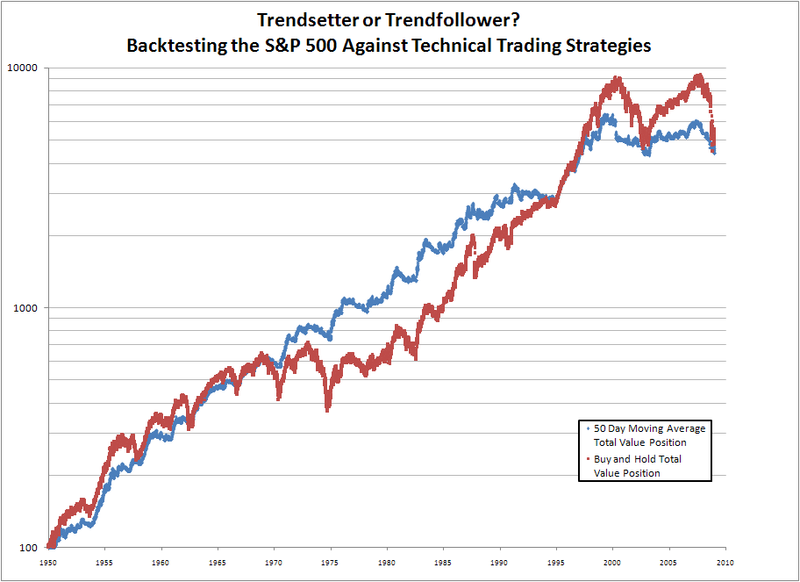 The following analysis was performed to backtest the S&P 500 against two investment strategies. A common belief is that the 50 day moving average (SMA) is indicative of a resistance level or support level for the market. When the price crosses above it’s 50 day moving average it means that investors are willing to pay more for the stock than the average of the previous 50 days and is typically regarding as a technical bullish signal. Only buy when the S&P 500 crosses above the 50 day moving average, sell when the price drops below the 50 day moving average. Investment returns are about the same over long periods of time: e.g. Buy and hold strategy had a 49 fold return versus the 44 fold return of the SMA strategy. Transaction costs add up and shouldn’t be ignored: The SMA strategy would have had resulted in 881 different transactions over the time period analyzed. At a ballpark cost of $5/trade, the SMA trading strategy would have cost $4405 resulting in returns being entirely eroded. Based on this, different demographics may have different investment objectives. It makes sense in general for young people to have a more aggressive portfolio as to fully expose themselves to the full upside of the market over long periods of time, similarily it makes sense for older people to have a more conservative portfolio that is geared towards capital preservation. In the current market, I am looking to change my allocation from a moderately conservative portfolio to something more aggressive. Generational lows in US housing sales and vehichle sales should support a floor to certain sectors of economic growth. In addition, credit market spreads (leading indicator) have improved greatly since the Lehman bankruptcy in September and price to earnings ratios seem relatively close to fair value given the large expected drop in corporate earnings. In summary, paying attention to the SMA may be useful for people looking to reallocate money into a higher returning investment with most of the upside exposure, yet wanting to avoid the potential for more drops in a volatile bear stock market.